The diabetes screening panel checks blood markers related to diabetes. What is the diabetes screening panel? The diabetes screening panel measures the glucose & hemoglobin A1c blood levels. Why is the diabetes screening panel important? The diabetes screening blood test panel can identify new cases of diabetes. This Diabetes Screening Panel is a blood test. The diabetes screening panel screens for diabetes by measuring diabetes blood markers. This diabetes screening lab panel includes the glucose test and the hemoglobin A1c test. The components of this diabetes screening panel help identify blood sugar abnormalities at a point in time and over the past several months. Many people start to worry that they might have diabetes when they have symptoms such as frequent thirst or urination (especially at night) or if a close relative gets diagnosed with it. While getting equipment to check one's blood glucose at home is a good starting point, there are instances when a single reading won't paint a more complete picture as to whether one might be at risk. In those situations, getting a blood glucose test and a hemoglobin A1c test through panels like the diabetes screening panel will give one a better indication as to how stable the blood glucose levels have been over a period of time. To get a diabetes screening test panel near you, simply order online and get your blood drawn at the Quest Diagnostics lab that you selected. When your diabetes screening lab results are ready, they will be available for electronic download. 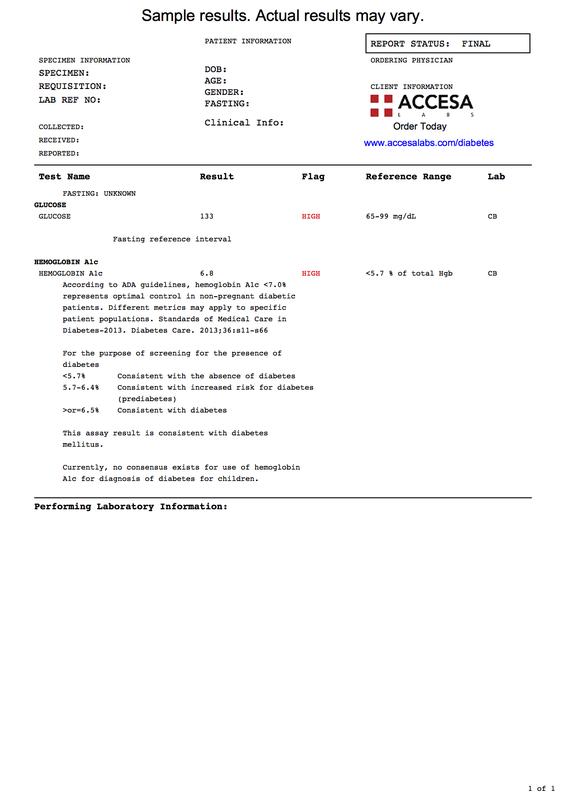 As can be seen on the sample diabetes screening lab report above, individual components of the diabetes blood screening panel are reported as numbers and can be compared against the reference ranges provided by the lab. For a more detailed diabetes lab test panel, please see the diabetes management panel. Diabetes Screening Panel at Guaranteed Prices.